The tiny elf ran, slipping and sliding on the snow and ice, all the way from Santa's workshop to the potting shed and greenhouse where the Christmas Cottontail was busy getting ready for his big night helping Santa. It was late afternoon, and there were just two days left before Christmas. Just as the Christmas Cottontail was ready to take a break for clover tea and green bean cookies, one of his favorite snacks, the tiny elf burst through the door. He was out of breath and could barely wheeze out his big news. "Santa would like to meet with you up at the toy workshop." 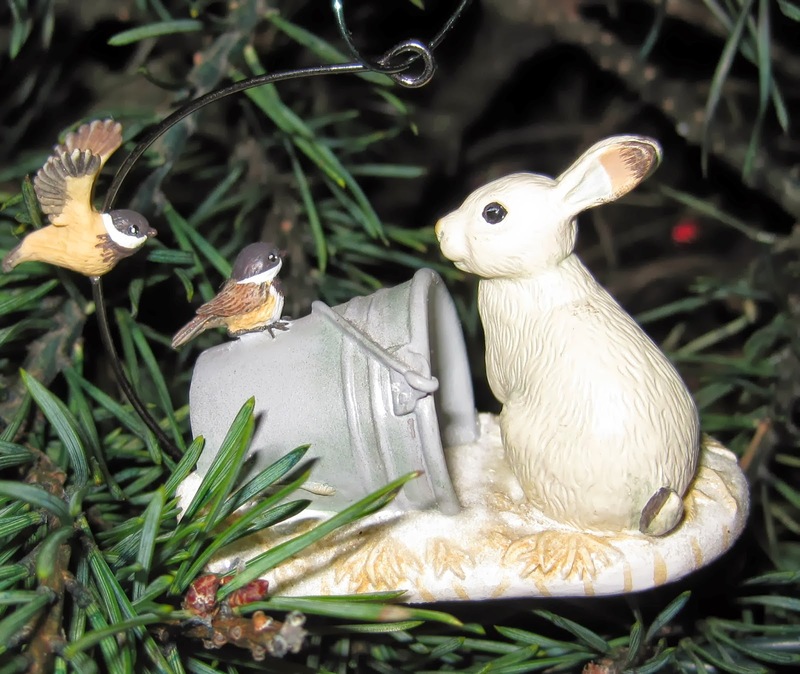 The Christmas Cottontail wondered what the big meeting could be about. He had already met with Santa to go over his list of good gardeners and bad gardeners. He had packed almost all the seeds and bulbs he would be delivering to the good gardeners and was ready to load them onto Santa's sleigh. The elf repeated his announcement. "Santa would like to meet with you up at the toy workshop." Then for emphasis he added, "right now". Reluctantly, because the Christmas Cottontail didn't like to have his breaks interrupted, he gave some orders to his helpers. "Bees, I need you to finish packing up the last of the seeds. I don't think we need any more of the flowers to be pollinated. Just pack up the seeds. Chipmunks, please stop eating the bulbs and load them into those sacks over there." Satisfied they would carry on without him there to supervise, the Christmas Cottontail followed the elf up the path through the pine and fir trees to Santa's office, just down from the main toy workroom. The Christmas Cottontail thought he heard elf's whispering to each other as he walked by and out of the corner of his coal black eye, he caught one or two of them pointing at him. He ignored them all and hopped straight into Santa's office. Santa swiveled his chair around to face the Christmas Cottontail just as he entered the room. "Thank you for coming so quickly, Cottontail", said Santa. "My pleasure, Santa. The elf made it seem quite urgent that I see you now", said the Christmas Cottontail. "That's right. It's urgent. We haven't much time, Cottontail, but I think we have just enough time for your new assignment." "New assignment?" The Christmas Cottontail silently groaned. He had plenty to do just to scatter seeds and plant bulbs for the good gardeners. He had no idea how he could take on a new assignment. "Yes", continued Santa. Do you remember how I found you one Christmas Eve, shivering and cold and attempting to steal some carrots left out for my reindeer? Do you remember how I took pity on you and brought you back here to the North Pole? How the elves trained you to sow seed and plant bulbs with a flick of your whiskers so you could help me each Christmas Eve? Sure, I know you remember it." Indeed, the Christmas Cottontail did remember and was forever grateful to Santa for all he had done for him. Santa continued. "You've done a marvelous job and so I'm going to reward you with a new assignment." The Christmas Cottontail hardly thought a new assignment was a reward, but Santa had always been good to him, so he didn't argue. "Cottontail, your new assignment is... oh, who am I kidding? There is no new assignment. I just wanted to tell you what a nice job you've been doing and tell you again how delighted I am for you to ride along with me on Christmas Eve, scattering seeds and planting bulbs for all the good gardeners.? The Christmas Cottontail breathed a sigh of relief, thanked Santa, and turned to leave. He still had quite a bit to do before Christmas Eve, and just two days left to do it all. Those rascally Chipmunks never change do they? Merry Christmas. You can tell this is a fairy tale because he didn't actually get a new assignment as a "reward." We can all be glad to avoid an extra assignment at this time of the year. And always good to get a pat on the back. Merry Christmas.